Now if you've seen the ads on TV or the full trailer, you might be coming into this film thinking it's a dramatic thriller with a little bit of The Matrix and Inception thrown into the mix. The movie does have it's dramatic moments, but the tone of the film is actually quite a bit more lighthearted than you've been lead to believe. Damon stars as a political candidate whose aspirations are dashed after a video surfaces of him in a bar brawl and then mooning the camera (really, this is the worst a guy can do to not get elected?). He meets a woman quite by accident just before his concession speech but the encounter energizes him enough to go off script, win the hearts of those who had previously supported him and gives him a shot to run again in four years. But he can't get the woman out of his mind after he runs into her again on a bus – something he was never meant to do because there are a group of people who watch and manipulate almost all of our actions, at least the ones that will have a major impact on our lives and the lives of others. Because one of these guys was sleeping on the job, the encounter on the bus throws the world out of balance and it must be corrected before the ripples cause major havoc. While I was expecting something much darker, I was ultimately charmed by the love story between Damon's David Norris and Blunt's Elise Sellas. Even when faced with obstacles that are designed to keep the two apart, Norris does everything he can to make sure the two stay together (even though she has less faith in him with his constant disappearances from her life). Norris even goes so far as to enlist the aid of one of the Adjustment Team members, the one who threw everything out of balance in the first place, and learns all of their secrets including how they travel from place to place through various doorways with the aid of their magical hats (yes, hats). I would even go out on a limb and say that these beings who are not supposed to be seen are actually something like guardian angels. Religious terms are never explicitly mentioned, but you can certainly see them if you just read between the lines. That doesn't make the film a religious experience, though, because director George Nolfi keeps things firmly set in the realm of science fiction as far as how the Adjustment Team operates with all of their gadgets. Everyone in the cast is excellent but Damon proves once again why he's a star admired by film-goers around the world. He easily plays the everyman caught up in bizarre circumstances that anyone can relate to, and he can handle all of the action scenes without seeming like he trained for months for just such an occasion. He's masculine but not overly so, and you're never threatened by him. Like the old saying goes, he's someone women want to be with and men want to be (and vice versa). I didn't jump on the Matt Damon bandwagon until he did the Bourne series of films, but since then I've really admired his work in everything from The Departed to his guest appearances on 30 Rock. 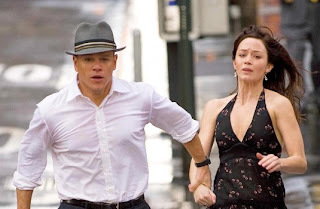 I can't picture another actor who could find the right balance of machismo and vulnerability that Damon has in The Adjustment Bureau, and the success of the film's premise lies squarely on his shoulders and makes the film well worth seeing. The Adjustment Bureau is rated PG-13 for brief strong language, some sexuality and a violent image.